With this new design Look have positioned the carbon blade placed at the heart of the pedal creating their most aerodynamic pedal ever. Two channels at either side of the pedal further optimise airflow. The carbon blade allows for a more rigid cleat release which ejects the foot more quickly than a traditional spring. Very large (700mm vs 400mm of original Keo) and wide pedalling surface. Very light at 288g for a pair including cleats and hardware. 3 cleat release resistances - 12 /16 / 20. Carbon pedal body and cromo axle with large stainless steel cleat platform. Supplied with grey 'Keo Grip' cleats. 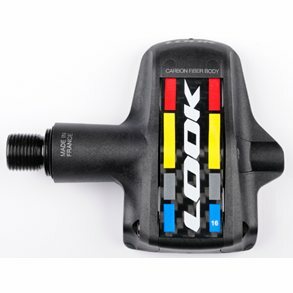 The broader lighter weight platform immediately improves power to pedal. The broader base catches more pressure from the center of force regardless of shoe and placement. The lightweight improved rotation in forward or pulling motions. The look logo is neat but not need in the basic Ti version. I though it was lighter and if it is it's not measure able .